When it comes to building furniture, nobody does it as well as the Amish do. These are people who have an incredibly strong work ethic and take pride in every piece of furniture or artwork that they make. When you buy handcrafted Amish furniture, you know that you are getting items that are going to last a lifetime and will always be great conversation pieces because of their beauty and originality. When you purchase furniture built by Amish hands, you can be sure that you will receive nothing but the highest quality items, made from the best American hardwoods. Nothing but the best of materials goes into handcrafted Amish furniture, and when you visit the Amish Originals Furniture Co. show room in Westerville, Ohio, you will really see what we mean. At the turn of the 18th century, Jakob Amman, a Swiss Christian who did not like the methods that the Mennonite church used to discipline its followers, branched out on his own and created his own church, and followers would be later known as Amish. Shortly after forming his church, Amman took his followers to seek out new lives in the United States. Most of these immigrants settled around Pennsylvania and in the Midwest. They set out to build up their own communities, and became well known for their strong work ethic, pride in their work and great attention to the little details that make their furniture as artistic as it is functional. 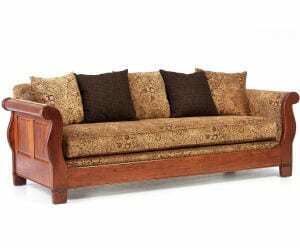 When you buy handcrafted Amish furniture, you can be sure that you are getting furniture that is going to stand the test of time and be durable enough to take whatever your active family has to throw at it. No matter where you live, whether you are in Central Ohio or anywhere else, you can have your purchases from Amish Originals Furniture Co. delivered right to your home. If you have a large vehicle or a pick-up truck, you can save money by bringing home your purchases yourself. If you prefer not to have to do all of the heavy lugging, for an additional $49, you can have your items brought to your home by professional delivery drivers within a 20 mile radius. If you live outside the Central Ohio area, you can arrange to have your purchases shipped to you. Simply ask for a shipping quote, either by contacting the store ahead of time or at the time of your purchase. If you are looking for beautiful handcrafted Amish furniture, you will find everything you need for every room in your home at Amish Originals Furniture Co. In addition to beautiful and durable furniture, you will also find amazing pieces of artwork and unique one-of-a-kind items for yourself and to give as gifts. Visit the show room today, and see the difference between quality, hand-crafted home furnishings/décor items and the lesser quality items you will find at the popular department stores and discount furniture stores. Feel free to visit our website at amishoriginals.com to build your wishlist.